We’ve found great deals at 534 hotels! 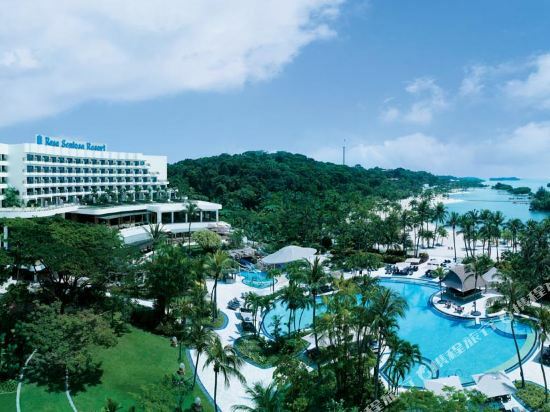 Shangri-La’s Rasa Sentosa Resort & Spa Singapore is Singapore's only beachfront resort. The hotel's 454 guestrooms offer hill, garden or seaside views, and all include private balconies. For recreation, the Rasa Spa is an ideal venue for rest and relaxation, while the Sea Sports Center provides a number of exciting beach and water activities. The Cool Zone, loaded with games and activities, designed to keep the kids entertained while parents can relax with ease. Embark on a gastronomic journey at Shangri-La's Rasa Sentosa Resort & Spa with a variety of dining experiences and cuisines. Dine On 3 brings you a brand new destination dining concept with a cluster of restaurants and a bar under one roof. Enjoy a seaside dining experience at Barnacles Restaurant, best known for its fresh seafood and grill selections. Enjoy a drink at The Bubble Bar before or after your meal. The new Siloso Beach Bar features a soda fountain and an ice cream bar for more fun under the sun by the swimming pools. Shangri-La’s Resort & Spa provides a complimentary shuttle service to and from Vivo City daily. The Harbour Front MRT station is located in VivoCity, so you can explore the city and various tourist attractions anytime at your convenience. 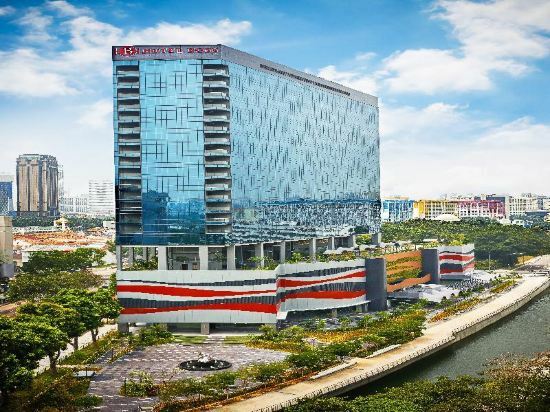 Conveniently located along Victoria Street, Hotel Boss Singapore is a short distance away from Lavender MRT Station and under 20 minutes from Changi Airport by car. Famous attractions, such as Bugis Village and the 24-hour Mustafa Centre shopping complex are within walking distance. Other attractions such as Little India and the Sultan Mosque can easily be reached from the hotel as well. Guest rooms include Wi-Fi, air conditioning, flat screen televisions, an electric kettle, and a private bathroom with toiletries and a hairdryer. Some rooms also offer views of the city or harbor. This hotel is nonsmoking. Both halal and non-halal breakfasts are offered each morning. Many facilities are available to guests including a gym and children's play area. After a long day of traveling throughout the city or handling business affairs, guests can relax on the sky terrace or go for a swim in the outdoor pool. Guests can inquire about tourist information with the 24-hour reception staff who are also able to assist with currency exchange and luggage storage. Hotel Boss Singapore also has a business center, while laundry and dry cleaning services are available at a surcharge. For those looking for a bite to eat, Nanjing Restaurant specializes in Huaiyang and Cantonese cuisines, while Founder Rou Gu Cha serves the some of the most well-known rou gu cha in the country. Jubilious offers local and halal fusion dishes. For something sweet, head to The White Ombré Café to choose from a wide selection of cakes. 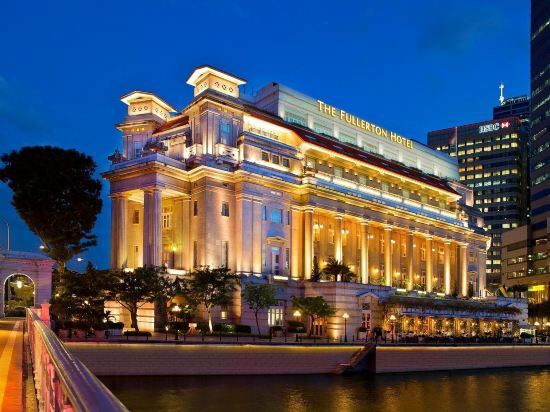 Located in the heart of the Civic District, the Fullerton Hotel Singapore occupies the original neo-classical Fullerton building, built in 1928 as part of the then British colony's centennial celebrations. Lying at the forefront of Raffles Place, it is minutes from the main shopping district and also enjoys close proximity to Singapore's bustling riverside entertainment belt as well as the cultural venues of Victoria Theatre and Concert Hall, the Esplanade Theatres on the Bay and the Asian Civilisations Museum. The luxury rooms and suites of this Singapore hotel overlook either the sunlit atrium courtyard or offer sweeping panoramas of the city skyline, river promenade or sea from their balconies. All rooms and suites offer complimentary high-speed Internet access. The hotel's five restaurants offer Chinese, Singaporean, Japanese and Western cuisines. Among them, the Lighthouse offers Italian dishes at the apex of the hotel where lighthouse keepers once guided ships in. Events can be held in one of nine meeting rooms, the grand ballroom entered by sweeping staircases, the elegantly appointed Straights Room (once the billiards room of the exclusive Singapore Club) or among the sculpture and greenery of the East Garden. Meeting rooms at the Fullerton Hotel can also be interfaced with a local area network (LAN). Guests can take a dip into the hotel's outdoor infinity pool sitting below the grand columns of the hotel overlooking a park. The hotel also houses luxury shopping boutiques, a fitness center, a spa and even a museum. The Fullerton Hotel Singapore is recognised as one of the Top 10 Hotels in Singapore by DestinAsian’s Readers’ Choice Awards 2017 and one of the Top 1 Percent of Hotels in Singapore by TripAdvisor Travellers’ Choice Awards 2017. 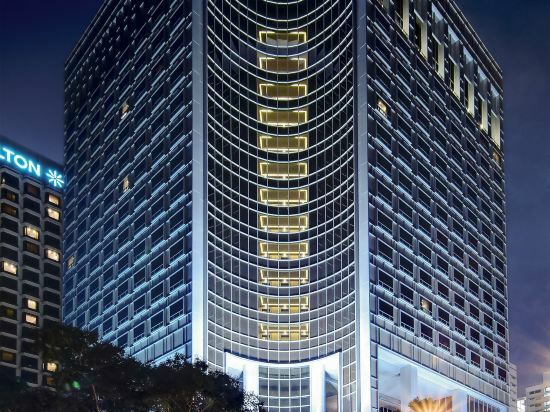 Strategically located in the heart of the city, the 940-room Carlton Hotel is located just minutes away from Singapore’s busiest financial and convention centres. 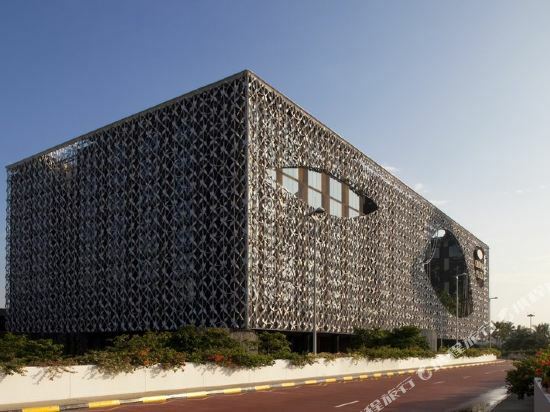 These include Suntec Singapore International Convention and Exhibition Centre, Sands Expo and Convention Centre, Esplanade – Theatres on the Bay, Singapore National Museum and major shopping belts in the Marina area as well as Orchard Road. The hotel is located just a short 5-minute walk from City Hall Interchange, Bras Basah, Esplanade, Bencoolen and Bugis MRT stations. Raffles City Shopping Centre is just opposite the hotel and Changi International Airport is a 20-minute drive away. The hotel offers guest rooms and suites from 30sqm with contemporary design to suit your business and travel needs. For more upscale accommodation, stay in our Premier and Premier Club Rooms from 34sqm with full access to the Premier Club Lounge. Available in all guests rooms are complimentary high-speed Wi-Fi, personalised smartphones offering complimentary 4G mobile internet, local and international calls to selected countries as well as PressReader, a complimentary e-news service that offers access to thousands of publications. Host your meetings and events in any of our 13 meeting rooms. From the high-ceiling and pillarless Empress Ballroom for up to 600 guests to the cosy Istana Room featuring natural daylight, we offer flexible function venues to suit any event or occasion. Indulge in the finest Cantonese cuisine at our award-winning Wah Lok Cantonese restaurant, all-day dining Café Mosaic offering international buffet and local favourites or enjoy freshly brewed coffee or tea with freshly baked pastries at Tuxedo Cafe & Pâtisserie. Stay at the ultra-modern Crowne Plaza Changi Airport hotel, linked in seconds to Terminal 3 and 25 minutes' drive from Singapore. Crowne Plaza Changi Airport 's dramatic exterior consists of a metallic latticework of tropical flowers, a motif that permeates the hotel's sharply modern interior. Your eye will be drawn to the curvaceous sofas, inspired by papaya and watermelon , in our futuristic Lobby. Head straight to your calming room to refresh with a rainfall shower or retreat to our sumptuous spa for a range of massage treatments . A cutting-edge link bridge connects Crowne Plaza Changi Airport to Changi Airport's Terminal 3 , with Terminals 1 and 2 reachable by Skytrain. We're just 10 minutes from Changi Business Park , home to banks and multinationals, and you can reach the city by taxi in 25 minutes. Discover the tropical resort hidden inside this hotel, with courtyard gardens and a landscaped pool area. You'll find peaceful garden views from the Lobby Lounge or in our al fresco courtyard. Immerse yourself in '70s glamour at Bar'75 with intimate nooks for cocktails. You can pick your own fish from the tank and dine Cantonese-style at Imperial Treasure . Host a tropical garden reception, conference or wedding in our 7 meeting rooms and ballroom . Stunning design and the latest technology ensure a stylish and successful event at Crowne Plaza Changi Airport . 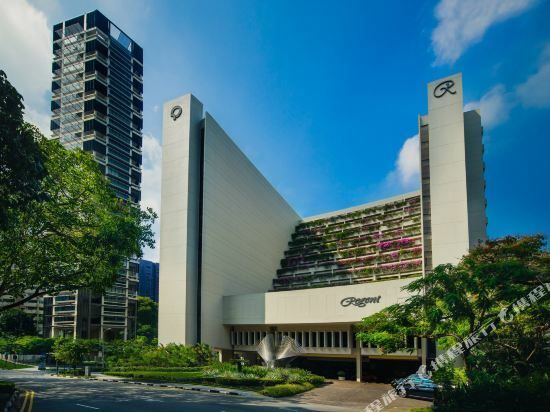 Regent Singapore offers luxury, privacy and amazing service all in the heart of Tanglin, one of Singapore's premier districts just a short walk from shopping mecca Orchard Road and the famous Botanic Gardens. The spacious guestrooms in this Singapore hotel, including 46 suites offering private balconies, are decorated in a fusion of East and West interior design. The hotel's collection of historic artifacts—some as old as the 15th century—and original art reflect Singapore's diverse cultural heritage. Each room offers three international direct dial telephones (on the bedside table, desk and in the bathroom) a mini-bar, refrigerator, in-room safe and radio. The color TV located in each room offers a selection of international channels including ESPN, STAR Sports, Discovery, NHK, BBC, CNBC, CNN in addition to a number of in-house movies. High speed internet access is available in all deluxe rooms and suites. Bathrooms feature a number of luxury touches including thick towels, robes, slippers, hairdryers, Japanese Yukatas and L'Occitane bath products. Discerning business travelers can upgrade to the Regent Club executive floors for exclusive access to the floors' dedicated lounges as well as wireless internet, complimentary breakfast, evening cocktails and private meeting rooms. Singapore is one of the smallest countries in the world. It’s located in Southeast Asia, adjacent to Malaysia. Known as a city of gardens, its favorable living environment has earned it its place as one of the most liveable cities for 16 consecutive years. Good air quality, multiple options for tourists, varied entertainment activities, diverse cuisine, and excellent public security make Singapore an ideal destination for overseas travelers. Tourists generally flock to the city center and Sentosa, an island off of Singapore’s coast. The iconic landmarks in the city center are all relatively close. Merlion Park, Marina Bay Sands Hotel, Gardens by the Bay, and the Ferris wheel are all concentrated in the Marina Bay area, though the subway can be taken to reach other destinations. Sentosa can be reached by subway or via the cross-sea walkway. There are buses and beach trains on the island as well. Visitors often choose to spend 4-5 days in Singapore, and 1-2 of those days can be spent exploring the sights, shopping, and food on Sentosa. Singapore has a very small temperature difference all around the year, with an average annual temperature of 23-33°C. There is a lot of precipitation throughout the year, and there are frequent showers and thunderstorms throughout the island. Luckily, however, they don’t often last long and it’s cool and comfortable after the rain. Typhoons rarely hit the country and there’s not much of a temperature difference between day and night. The country’s rainy season lasts from November through March. Affected by the northeastern monsoons, the air is humid and the coldest in January. The dry season lasts from April through October, while the period from June to September is affected by the southwestern monsoon and the air at this time is relatively dry. It’s recommended to wear clothing suitable for hot weather. It's also a good idea to bring a thin coat because the air conditioning levels are often low. Hotels in Singapore are divided into economical mid-range, luxury and high-end types, and there are also some luxury resorts on Sentosa. Singapore has a very small, so most budget hotel rooms have a small area, but the general facilities are perfect and the rooms are clean and comfortable. Most of the luxury hotels in Singapore are clustered in downtown Marina Bay and Orchard Road, while economic hotels are mostly in Chinatown, Little India, and Geylang. The Chinese Lunar New Year, June (due to the Great Singapore Sale), September (due to the Singapore Grand Prix), and the end of December through early January are the peak seasons for tourism in Singapore and hotel prices are known to increase during these times. Singapore hotel information & deal: Check out room rates, photos, a map and reviews of hotels in Singapore and find the best deals on Singapore hotels. Trip.com offers big savings on online reservations for Singapore accommodation. Book Singapore vacation packages and Singapore tours with huge discounts on Trip.com!